He-Man and the Masters of the Universe Magazine #10 is the Spring 1987 issue. This one’s largely dinosaur-themed. It feels like content is down and ads are up. This is due in large part to the fact that Mattel is getting the best of both worlds by including a full page schedule for the Power Tour as content, and, on the movie front, we get a photo spread of many of the cast members in character, as well as the movie contest winner, Richard “Pigboy” Szponder. And there are only three unremarkable activities here: stained-glass coloring (it’s much more obvious than the last one), a super-easy crossword, and a low-difficulty maze. Tying in with these toys, there’s a fairly interesting two-page introductory survey of dinosaurs. Here also we get a plug for one of my all-time favorite books: David Peters’ Giants of Land, Sea & Air: Past & Present. The He-Man of the Issue is ’80s chess sensation K. K. Karanja. There’s only one Earl Norem poster included, and it’s not the cover. It plugs the three new Power Gear accessories, and to that end features Castle Grayskull with a moat for the first and perhaps only time. 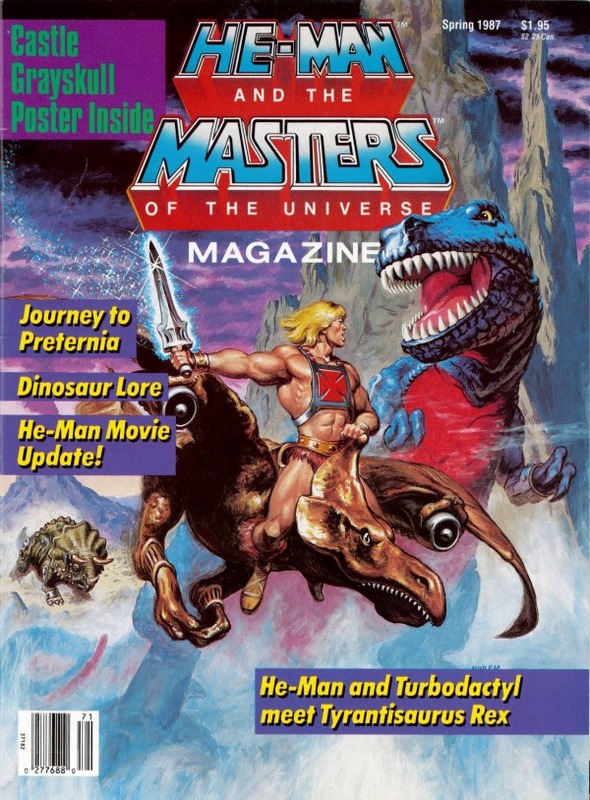 A final thought: one can’t help but contrast the photo of Jack Wadsworth as Power Tour He-Man with those of Dolph Lundgren as movie He-Man and wistfully consider whether the live-action film couldn’t have given us some kind of happy compromise. Freakin’ William Stout.